I’ve been obsessing about The Pikeman’s Lament since it was released a month or so ago and having recently abandoned the Vimy Project I’ve launched straight into trying to get some units together to play a game. Of course I have a pile of DBA-X ECW units I COULD use… just use casualty markers… But I happen to HAVE a lot of individually based ECW figures anyway, so I shouldn’t take much to organize dedicated units for Pikeman’s Lament. 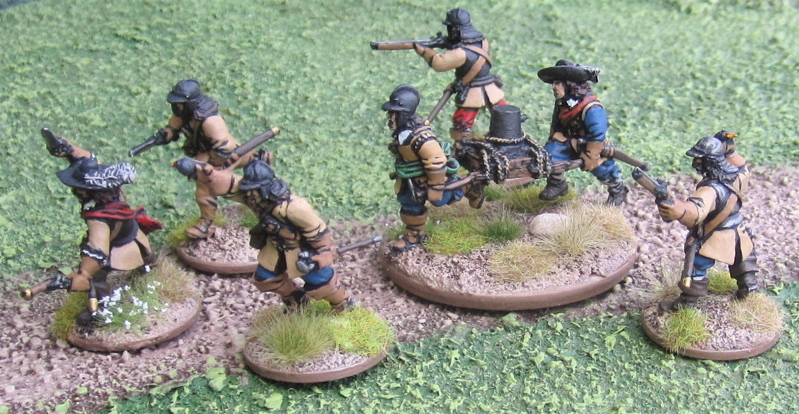 Picking some “low-haninng fruit” I painted up three dismounted cavalrymen that finishes up three units of “Forlorn Hope” – smallish units of hard-hitting elites – similar to the dismounted knights (Foot Men-at-Arms) in Lion Rampant except… y’know… with muskets and the like. En Garde!</a> was approaching!) 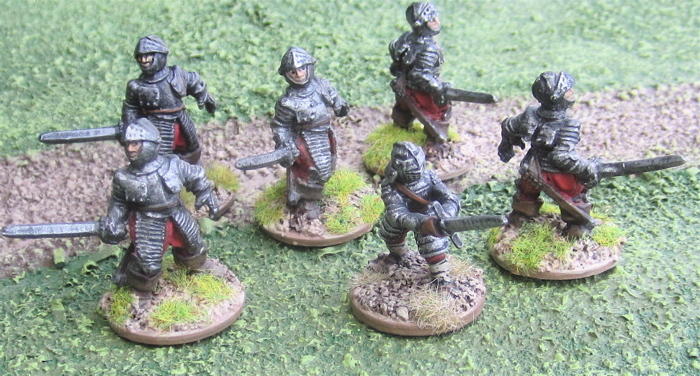 I mostly ordered them fort the OTHER figures in the pack – which I painted shortly after their arrival. These are copies of figures I already owned and had painted… so… there was less motivation to get them done… (until now!!). 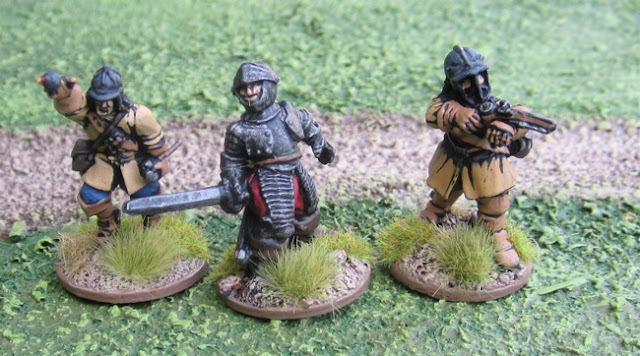 The four cuirassiers that are identical to the newly painted one I have had for-EVAR – I actually painted them 27 years ago! Forlorn Hope #2 – Figures from Wargames Foundry and Dixon Miniatures again. This unit doesn’t actually include any of the newly painted ones above… I just thought I’d include a picture of them. As with the cuirassiers above, a couple of these chaps were painted 27 years ago. Can you guess which ones? Forlorn Hope #3 – figures are mostly f from Warlord Games - with one from Wargames Foundry. The entire storming party from Warlord Games... which I guess could be fielded as a Forlorn Hope of its own - if you could imagine the petard stand as a single element thus making a unit of six. I imagine I would more likely use the petard as a “token” of sorts in a scenario that has to be escorted to the gate of an enemy fortification and left there long enough for the storming party to clear away to a safe distance… much like the critters in the foraging or rustling scenarios. Good to be back working on a project I actually WANT to be working on! I actually completely reorganized all my ECW figures into four DBA-X armies (ECW Royalist, ECW Parliament – with options to make an ECW New Model Army, ECW Covaneteers, and ECW Scots Royalists) and four similar Pikeman’s Lament forces – with a few options for each. I've ordered just a few new miniatures to finish up a couple units in each. Despite these English Forlorn Hopes the most likely forces to be completed first will be the Scots. More English Civil War for Pikeman’s Lament! Or possibly even some JET BIKES for Faustus Furious 3000! Great work on those figures. Not really my period but I do love a good skirmish game... it has me tempted. Thank you, Pete! have you looked at any of the other rules by Dan Mercy (Lion Rampant, Dragon Rampant, Men Who Would be Kings)? They're all very simple and very fun - but they're larger skirmish games - with 4-6 units of 12 foot or 6 mounted. If you're looking for a smaller scale skirmish for this era have a look at En Garde (also by Osprey) it plays with about a half dozen per side. I'll keep an eye out for them. I was planning to use the Witchfinder General set as I have heard good thingfs about it, though taking out the fantastical elements. Looking good! The ECW/30 Years War/3 Musketeers era/genre always appealed to me. As you know, I am going for a more dwarvish look for my "armies". Although I would like to have non-dwarven opponents for them. Maybe I should have gotten some of Foundry's old fancy orcs back in the day, the ones that look a bit lanskhect-ish... In a pinch I could just use my fantasy orcs armed with bows and spears and such. Ah, thanks for that link! I will have to figure out which figures to get. Yeah, if I do smaller units it should be good. Well done Tim, they look superb, love the brown colors! Fantastic results, hard to pick the new ones from the 27 year old ones. Great stuff. For your infomration I have recently published on my blog my Hott adapations for ECW. This project is directly inspired by YOUR stuff. Great Stuff, Benoit! I will definitely try it out next time I get the DBA/HotT ECW armies on the table! Your dismounted dragoons in buffcoats are fab! Thanks Jonathan. I have some Irish on the workbench I hope I'll get a chance to finish up soon! Great looking ECW types, I'm going to do a big battle soon with my nephew, maybe Cropredy , got lots of infantry painted could do with some more cavalry and we're going to have a go at pikemans lament too. Well, when you do, post results! Countdown to Vimy – (less than) 5 weeks to go!